a bicycle because his vision was too poor to get a driver’s license. His devotion to cycling paid off. At the 1996 Paralympics in Atlanta, he and seeing partner set a world record for tandem cycling. 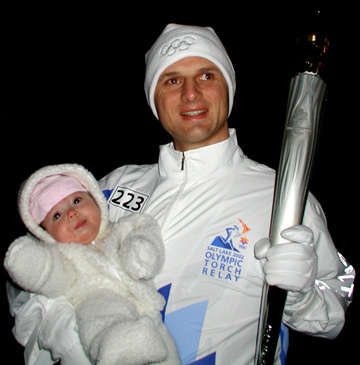 Next week, the 1984 Centralia High School graduate will carry the Olympic torch in his new hometown of Colorado Springs, Colo.
“The Olympic flame speaks to the passion and the commitment and the fire that burns inside of athletes that are driven to succeed,” he said. As the flame is passed to his torch, he suspects he’ll be overwhelmed with competitive spirit he felt during international competition in the Atlanta and Sydney, Australia, contests immediately following the summer Olympics at those venues. The 36-year-old traded racing for fatherhood in 2001: his daughter, Lavyn is now 15 weeks old. After a year off he’s training again, but wants to put family first. It’s a hard path balancing family and competition, the legally blind cyclist and inspirational speaker said. “At this point I’m kind of walking in untested waters. I’ve never been here before,” he said. “The last thing I’d want to do is sacrifice my family relationships or responsibility for my mission in sports”. The Paralympics are a parallel event showcasing the abilities of athletes who have disabilities that prevent them from competing in the mainstream Olympics, he said. “One’s expectations of someone with a disability shouldn’t be any lower than what you’d have for anyone else”, he said. Some people say the message of the Paralympics is one of hope, but he sees a deeper meaning. “I say it’s a message of high expectations, saying you need to regard people with disabilities as equally productive members of society,” he said. He has a web page explaining that message at www.thekinglink.com. His mother, still a Centralian, is understandably proud of her champion and torch bearing son. “I think it’s wonderful. I think he deserves it.” Sue King said. “It’s an honor”.